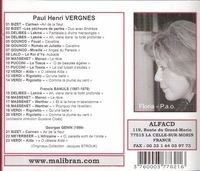 “Vergnes was discovered by the patron Castellan de Beauxhoste and studied singing from 1924 to 1928 at the the Paris Conservatoire. In 1928 he made his début at the Paris Grand Opéra. In 1929 he sang Iopas in a Berlioz’s LES TROYENS. From 1933 he also belonged to the ensemble of the Opéra-Comique, where as a beginning role he appeared in the title role of LES CONTES D’HOFFMANN. In this role he also had a huge success in Amsterdam under Pierre Monteux in 1932. At the Opéra-Comique he performed in 1938 in the premiere of Milhaud’s ESTHER DE CARPENTRAS. Later he worked as a vocal pedagogue in Paris. Banuls made his début at the Opéra-Comique in Paris on 2 July, 1927. Banuls frequently appeared in provincial opera houses and had a successful career appearing as Rodolfo, Hoffmann, Don José, Gérald in LAKMÉ, Pinkerton, Werther, Cavaradossi and Wilhelm Meister in MIGNON.